The idea that the Electoral College was designed to protect small states and protects them today is a myth worth busting. As a plan to elect our next President by popular vote—the National Popular Vote Interstate Compact—progresses toward its goal, proponents of the Electoral College are speaking up in its defense. A substantial chunk of those defenders are people who like the Electoral College primarily because it helped Republican candidates in 2000 and 2016, but there are those who offer a more principled defense of the institution. One of their most prominent arguments is that the Electoral College protects small states. There are usually two subparts to that argument. The first is that the Electoral College was designed to protect small states, which implies that changing it would somehow endanger small states. However, the notion that the Electoral College was designed to protect the smallest states in the country is at least partially a myth. The proof is in the pudding. If the Founding Fathers really wanted to protect small states in the presidential election, the Electoral College was a strange way to do it. Consider the context. At the 1787 Constitutional Convention every state, regardless of its population, had one vote for its entire delegation. In other words, every state counted equally. In addition, before creating the Electoral College, the delegates had already decided that every state would have equal representation in the Senate, a compromise that heavily benefited small states. Considering the rules of the convention itself and the agreement for equal representation in the Senate, it is clear that the conventions’ delegates were well aware of and willing to enhance the voice of small states when they deemed it appropriate. They could have given small states similar power when it came to the presidential election, but they didn’t. Instead, they chose to divide electoral votes among the states based primarily on population, which gave large states substantially more say over small ones. 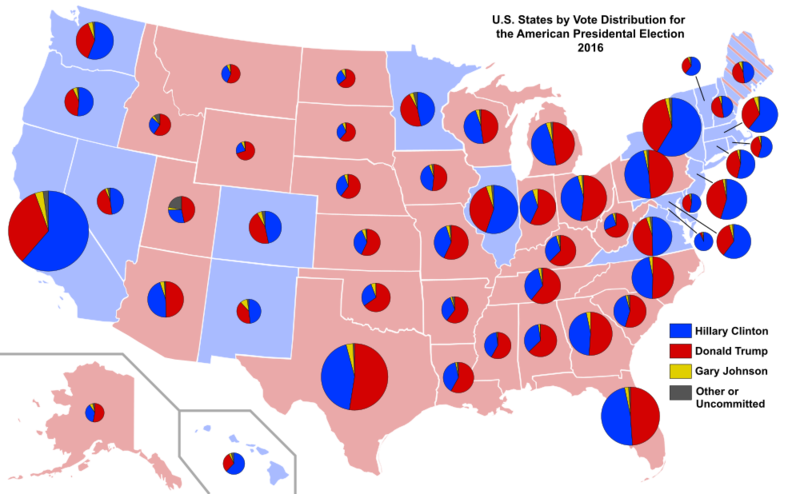 By giving all states a minimum of three electoral votes, the delegates gave small states some additional influence, but not nearly as much as they could have. In the first heavily contested presidential election of 1796, a candidate could prevail by carrying just five of sixteen states. One state, Virginia, had over fifteen percent of the country’s total electoral votes, which is an even greater percentage than California has today. For the purposes of a discussion about the Electoral College’s merits today it doesn’t really matter whether the Electoral College was designed to protect small states in 1787, but nonetheless, it wasn’t. Even at its inception, protecting small states was at best a minor consideration in the decision of how we choose our President. But let’s move from 1787 to the present, when many Electoral College supporters still maintain that it protects the interests of small states. As Tara Ross argued in her book Enlightened Democracy: The Case for the Electoral College, the Electoral College “ensures that the large states will not rule as majority tyrants over their smaller neighbors.” Apparently, Ross and others believe the Electoral College serves as a safeguard for small states against beastly tyrants like California, with its army of gay vegans, and New York, with its legion of soda-taxing trust fund babies, ensuring that those states don’t use their chosen presidential candidate to impose their ways on smaller states that comprise “the real America.” But is that true? Looking at the most populous states in the country says otherwise. The ten most populous states in the United States from most to least and the candidate their electoral votes supported in the 2016 election are California (Clinton), Texas (Trump), New York (Clinton), Florida (Trump), Illinois (Clinton), Pennsylvania (Trump), Ohio (Trump), Georgia (Trump), Michigan (Trump), and North Carolina (Trump). The ten least populous states from least to most and the candidate their electoral votes supported are Wyoming (Trump), Vermont (Clinton), District of Columbia (Clinton), North Dakota (Trump), Alaska (Trump), South Dakota (Trump), Delaware (Clinton), Montana (Trump), Rhode Island (Clinton), New Hampshire (Clinton). If you’re struggling to find a pattern of tyranny or protection from it, you are not alone. Three of the ten most populous states went for Clinton while seven went for Trump. However, of those seven, Trump won four of them by less than two percent. The top ten states easily could have gone five for Clinton and five for Trump. Being divided themselves would make it awfully difficult for the largest states in the country to impose any tyranny on smaller states. Would it be the tyranny of organic greens or of barbeque? The small states and District of Columbia were split five to five between Clinton and Trump, meaning that the small states were politically divided as well. Taken together, it sure doesn’t look like Electoral College protects small states with one set of values from big states with a different set of values. If anything, the big states which mostly went for Trump, imposed their “tyranny” on the smaller states which were more supportive of Clinton. And even if we imagine a future in which all the big states are on one side of the political spectrum and small states are on the other, the Electoral College would not serve as much protection for the Wyomings of the world. It would only take electoral votes from the eleven most populous states to elect a President despite the objection of the other 39 states and the District of Columbia. Breaking it down by vote totals, the Electoral College could theoretically lead to a scenario in which a candidate becomes President by winning about 34 million votes in the right states while their opponent wins about 94 million votes in the wrong ones. The truth is that it doesn’t. The Electoral College was not designed primarily to protect small states in 1787 and it doesn’t serve that function today. Those “majority tyrants” that people like Ross fear are villains in a child’s bedtime story. They may be scary, but they don’t actually exist.